I have a dirty little secret. I used to frequent another coffee shop. It had a mermaid as a logo. Well, one day I was lost and happened into a coffee store with a giant B in the sign. I grabbed my brew of Michigan Cherry and a love affair was born. As I was driving down Haggerty Road in Northville I saw the B again and I pulled in. Now, I am greeted by Bruce and Kim as though I am a member of the family. It's home. That would be enough for me but then I found out that my local Biggby really is my LOCAL Biggby. It's owned and operated locally. The beans are roasted here in my Michigan. The money I spend here stays here. That would be enough for me but then one day on Twitter I mentioned that my lovely bride did not share my Biggby love. That was when Biggby Bob engaged me in conversation. We talked about the issues that my bride had with Biggby. The key one being the issue of free coffee refills. It was not long after that my Biggby no longer charged for refills. My bride proudly carries her B mug everywhere now. That would be enough for me but then I got a job where I spend a lot of time in coffee shops meeting with high school kids. In Metro Detroit the B is ubiquitous. No matter where I go from Redford to Canton to Farmington Hills to Livonia there's a Biggby where I can enjoy my Michigan Cherry or my new favorite, Hot Cinnamon Spice Tea. Thanks Biggby! You help me find home anywhere in Detroit. Wow, even KNOWING how great they are about running this business, it's always so encouraging reading about follow-through like that (with the refills)! And NICELY written! Thanks guys! It's a great company. We have to keep spreading the word. 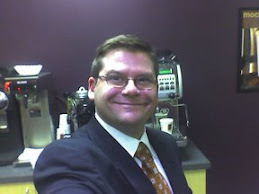 Daniel - what a great post - that is part of the "BIGGBY" way that we talk about! The coolest part is that we really do love our customers and listen to them and talk with them, they are the foundation of why we do what we do! It is customers like you that make that so enjoyable! Thank you for being a BIGGBY fan and being able to clearly articulate the reasons, it is awesome to read! Daniel - thanks for taking the time to get your thoughts down! 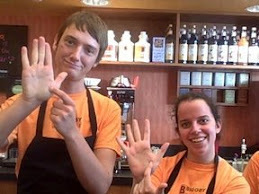 We love that you love BIGGBY COFFEE as much as the rest of us do! Keep spreading the BIGGBY COFFEE way. B happy, have fun, make friends, love people, drink great coffee!! Great post! I also enjoy the Cinnamon Spice ... that sounds good right now! Daniel, I've said as much already to you, but again, thanks for the great post. I look forward to hearing more from you in the future! Also, it's great to see other guest bloggers chiming in on each other's posts--feels like an extension of regulars chatting each other up in the store! Wow...Thanks guys! We might have to have guest blogger meet up in Lansing at the original store sometime in the near future! Nice guest spot, Daniel! It's a real treat to get to read all of these different voices talking about how each connects to their Biggby in their own way. Love it. My wife and I sat here and read your blog tonight and laughed till we had tears. You're not the ONLY one reading your blog anymore. WRITE MORE! PLEASE! Daniel - I think a tweet up / guest blogger convention sounds Beautiful! !